Set of 48 tobacco cards. Each card measures 1-1/2" X 2-1/2". 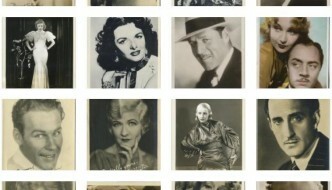 1935 Gallaher Film Partners cards each show an actor and actress in a scene from a movie they co-starred in. Names on front at bottom, text on back as shown in two sample images inside the gallery. Attractive cards but among the easiest to find. The following gallery includes images of all 48 cards from the 1935 Gallaher Film Partners set of Tobacco Cards. Just click on any image to open to full size and from there you can scroll through them all.